With Adobe Analytics, you have a couple of other possibilities to get data into the system. My colleague Brent Dykes has written a blog article on How to Get Data In and Out of SiteCatalyst – Part I, which lists the most important ones. Some other devices also used to be flaky at best: gaming consoles for example or custom-built touch screen devices that you sometimes find in stores or shopping centres (“malls” for you in the USA). But one reason still remains: size. If you want your pages to render fast (see Ilya Grigorik’s video “Breaking the 1000ms barrier”), you have good reason to strip every component of your site down to the minimum. set variables that would usually be set within the doPlugins method in the s_code.js file. Now s.t() calls doPlugins which might populate more variables. It then builds a tracking call, which really is just an HTTP GET request to Adobe Analytics data collection servers. I have tried to explain what the URL looks like in the articles about debugging here, here, here, here & especially here. Just look for the <noscript> tag on your own site! Adobe consultants have at some point stopped sending out code snippets that included the <noscript> part, but it is still around on a lot of web site. Unfortunately, practically nobody customizes the tag! Which means that it will track, but it will not even assign a pageName and your friendly marketer will therefore see URLs in some of the reports, which will likely puzzle him. Here’s my advice: either you use the <noscript> part properly, or you remove it. For those of you who run sites on PHP or Java EE, Adobe has tracking libraries that handle the creation of the URL for you! The s.track() method is interesting. In it’s “normal” form, it creates the <img> tag with the tracking URL. The browser, trying to load the image, will therefore contact the Adobe data collection servers and transmit tracking information. But you can flip a switch in the Java AppMeasurement and instruct it to send the tracking directly, server to server! If you set s.sendFromServer = true;, the call to s.track() will actually send off the tracking right then and there, straight from your server to Adobe’s. On the first tracking call ever, the system will notice that there is no s_vi cookie in the HTTP Headers. It will therefore reply to the browser with a HTTP Status 302, a redirect. On that response, it will add the s_vi cookie with a random visitor ID, and it will add a parameter to the URL that tells it “I have tried setting a cookie”. Now the browser will just go and request the new URL. If setting the cookie was successful, every tracking call from now on will contain the s_vi cookie with the visitor ID which allows the system to tie those hits together. If the browser does not set the cookie, the second tracking call will not contain the cookie but it will have the additional parameter. So the system will basically not try setting a cookie again and instead use a fallback mechanism. ‹ PreviousPoll – Relevant Content? I would look at the ascend of iOS and Android, because I think the “fully featured smart phone” sector has been driven by them. But it is notoriously hard to find hard facts about anything on the Internet. Too diverse a landscape for anyone to be sure. 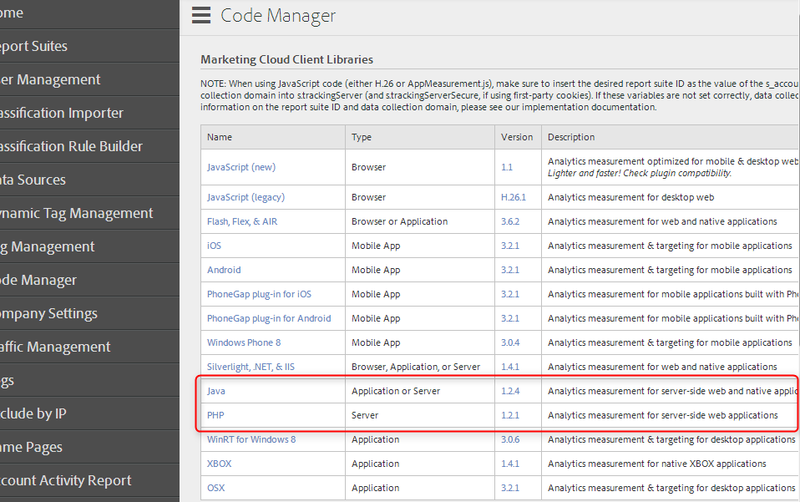 I want to use Java library to track server side, but some event (sent to adobe server) does not correspond to a page load, does user agent suffice to populate device , device type, browser report? Can I overrride server IP address to populate connection type report? Server-side tracking is an article in itself, I guess. To answer your first question: yes, User-Agent is enough for those. Overwriting the IP (with the IP of the browser accessing the site) would give you geo segmentation. Maybe it would also help with connection type, but I frankly never look at that report. Can’t see the benefit.